It’s not just for man caves. Your neighbor’s garage might be an R & D powerhouse. I’ve been struggling to get a simple stat that adequately captures the explosion of “garage-works” R & D we at Daily Grommet see originating from regular people, not just large companies. This grassroots investment in innovation is an essential cornerstone of Citizen Commerce. Stats are thin on the ground. No one has studied Daily Grommet, or Quirky, Big Idea Lab, or Edison Nation, or KickStarter or all the entities and individuals participating in this area. Or at least I thought so. But HAPPY DAY, my neighbor Marcia sent me an MIT Sloan Management Review article “The Age of the Consumer Innovator” that delivers just what I need. US consumer innovators are matching 33% of the R & D investments made by commercial enterprises. That is enormous, given our R & D intensive economy. 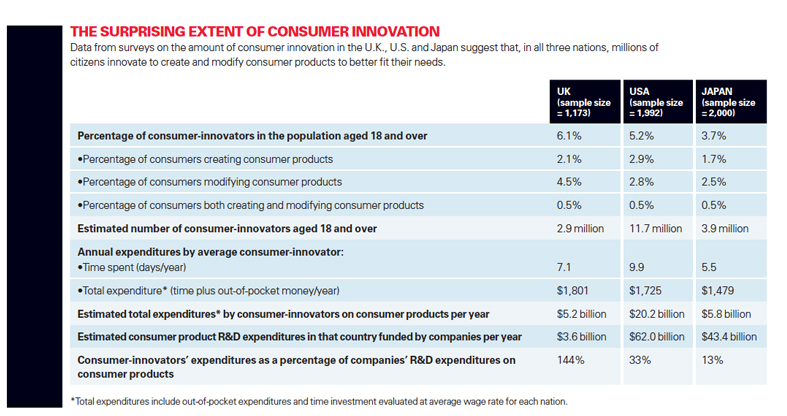 UK consumer innovators actually spend more! They log in with 144% of what all commercial enterprises spend as a group. Japan is a little wimpy, at 13% but even that is not bad for an R & D intense nation. We see 100 ideas a week submitted at Daily Grommet. That doesn’t happen for free. People are investing in R & D from their paychecks, and from friends and family, and investing proceeds from other ventures. These are the people creating the future of business. I am glad to put some numbers on it. It’s big and it is going to rock our world. In a good way.